Most of the timber from Corunna is going to Nowra, Narooma or Eden sawmills. Photo: Sean Burke. Conservationists are making their last stand for a section of Spotted Gum forest on the edge of Corunna Lake just south of Narooma. Protesters have been a regular site on the side to the Princes Highway since the harvesting operation got underway in late September. Early morning rallies today (November 9) and again tomorrow are emploring the NSW Forestry Corporation to stop the operation for the sake of a White-bellied Sea Eagle nesting site within the State Forest. “Our concerns are that the logging could disrupt the nesting eagles and their baby chick or scare them away altogether,” says longtime forest activist Sean Burke. “We had greater concerns when Forestry intended to reduce the perimeter of the 300-metres exclusion to 50-metres once the eaglet had fledged but they have now assured us that they will maintain the 300-metres which is a relief. “However, we do believe that the whole family could be very disturbed by the crash of trees and machinery even 300-metres away and once the eaglet fledges they may leave and not return. “They have two nests in the compartment, one that they use and the other that washes clean for the next nesting season. The one that they are not using at the moment has only a 50 metre buffer,” Mr Burke says. Over 50 protesters gathered at Corunna State Forest south of Narooma, Nov 11. Photo: Corunna Forest Facebook. Most of the timber coming out of Corunna is going to Nowra, Narooma, or Eden sawmills with the residue going to the Eden Chipmill. “Corunna State Forest has proven to be exceptionally high quality. To date, approximately 70% of the products harvested have been high-quality sawlogs with only 15% being a residue product delivered to the chipmill,” Mr Blessington says. 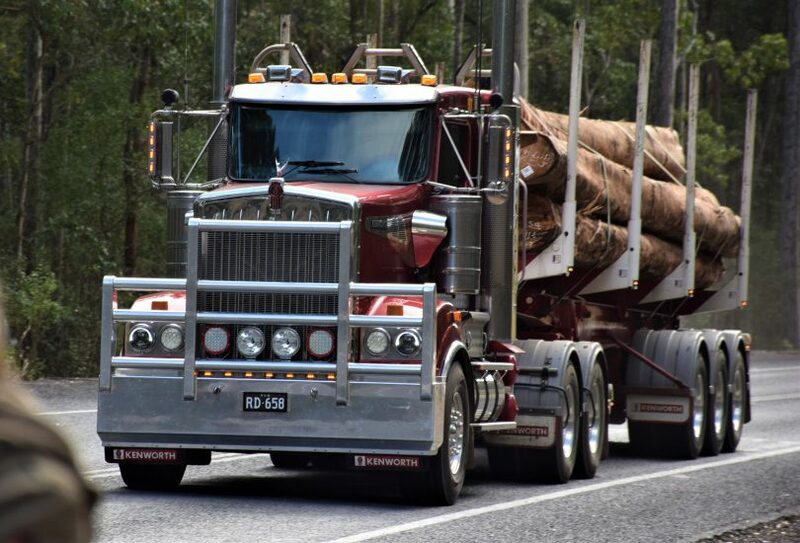 The Princes Highway cuts through the operation giving motorists a first-hand look at modern logging practices. “The work in Corunna State Forest is being undertaken in accordance with NSW’s strict native forest regulations,” Mr Blessington says. “The harvest contractor will be completing works this time with the 300 metre [sea eagle] exclusion zone intact. “There are 23 million hectares of forest in NSW. Only 4% of those forests are State Forest areas that are available for harvesting and of the areas available for harvest, only 1-2% are harvested each year,” Mr Blessington says. Mr Burke says he has seen the sea eagle family flying around above the protest. “The forest has been closed so we can’t go in there to check on them. The Forestry Corporation officer in charge of the operation, Jim Potter, goes in regularly and checks on them. He says that the chick is flexing its wings and he feels that it could fledge quite soon. “He is a man with a job to do and he takes pride in doing it well and we respect that. “The sound of the trees smashing to the ground has been particularly disturbing and for me, it gives me a tight feeling in my gut and chest each time they fall and seeing them piled up and leaving on trucks,” Mr Burke says. Forestry protests are nothing new for southern NSW, the familiarity of picket lines and placards in the forest means that many in the broader community have lost interest or struggle to engage with what in the past has been a hostile and at times violent debate. “The work in Corunna State Forest will be undertaken in accordance with NSW’s strict native forest regulations,” Lee Blessington, Forestry Corporation. Photo: Corunna Forest Facebook. Growing concern around climate change has however deepened the discussion in recent times through initiatives like the Great Southern Forest. “We’re using the opportunity provided by the highway location to highlight the problems with native forest logging, inform more people of our concerns and better options and put pressure on governments to take the sensible solution of finally putting an end to the logging of our native forests and transition into plantations,” Mr Burke says. This new way of forest management is centred around using state-owned forests as carbon sinks rather than using them for forestry. Drawing carbon from the atmosphere and locking it in trees. Prioritise forest preservation and restoration in the 432,575ha of SE public native State forests. With State and Federal elections due in the coming months, it’s an idea that will be tested strongly. In the meantime, the timber harvesting operation at Corunna will run until early December. 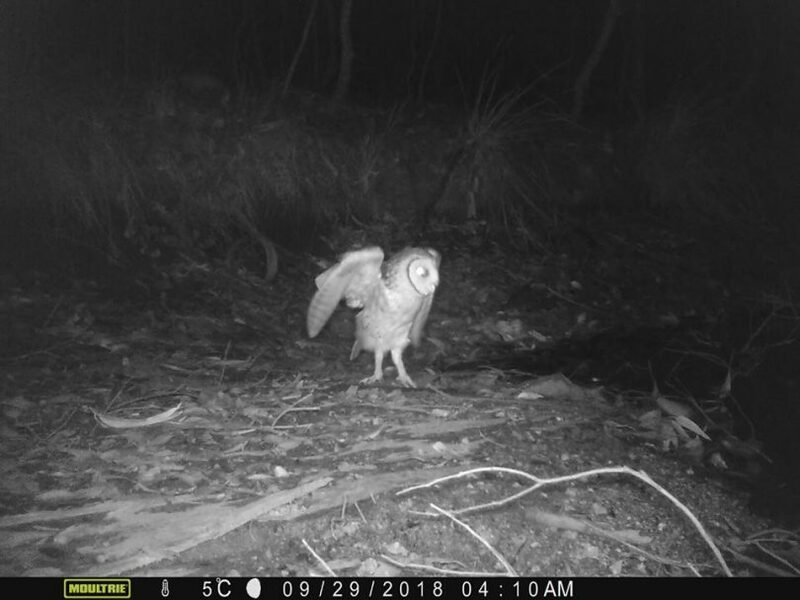 “We put a lot of time into surveying the forest before they [Forestry Corporation] started logging including installing night cameras where we detected an endangered Masked Owl. “The way in which they’ve handled the Masked Owl that we discovered is particularly disconcerting. “We were told that the protection provisions only apply to a nest but the forest was closed the next day so we were unable to look for the nest. “Because it is a territorial bird and won’t move home, the exclusion zone for the Masked Owl is 300 hectares . “We’re told that they [Forestry Corporation] can use a ‘landscape’ approach by setting aside 300 hectares somewhere else instead of the location of the owl but they won’t tell us where they have reserved this forest area,” Mr Burke says. Conservationists claim night cameras detected an endangered Masked Owl within Corunna State Forest in late September. Photo: Corunna Forest Facebook. In terms of the Masked Owl, the Forestry Corporation says one observation of an owl on its own does not trigger any Threatened Species Licence prescriptions. “These birds have large home ranges, around 1,000-2,000 hectares so a particular individual could be located anywhere in the landscape,” Mr Blessington says. “This is why large forest owls are managed at a landscape scale with a network of exclusions across the forest estate. “Most of our forested landscapes are occupied by owls at some time so we ensure that suitable habitat is conserved across the landscape. If a roost or nest site was found, that would trigger exclusion zones of 30m or 50m respectively. “Approximately half of the forest will be harvested and half left untouched, so large areas have been set aside for protection and conservation,” Ms Blessington says. Conservationists have vowed to continue their protest action as long as the harvesting operation continues. The maximum range of 1000 hectares (10,000,000 square metres) fits into a circle with approx. 1.8 kilometre radius. This means that the habitat offset method for this bird in this forest is not applicable. The whole forest would have had to be spared. This is but one example of why the community believes that Forestry Corp doesn't take threatened species seriously. The commercial imperative of the Wood Supply Agreements dictate that even reasonable conservation concessions can't be made. STOP LOGGING NOW! STOP STEALING THE INHERITANCE OF OUR CHILDREN AND GRANDCHILDREN. BE WISE rather than greedt and short-sighted. What an opportunity to make a difference! It is just harrowing that the logging went ahead without Forestry spending any time working with the residents who discovered it. Masked Owls have a flight range of 500-1000m which certainly places its roost well within the boundaries of Corunna Forest - this fact alone indicates that Forestry should have upheld its moral and legal responsibilities to honour the Threatened Species License in the full spirit of their conditions. A 300HA exclusion should have applied from the moment this owl was discovered. Had the owl discovered been a Sooty Owl or a Powerful Owl then the land set aside at Bodalla 20 years ago for all protected owls in the region could have been sufficient. Sadly the Masked Owl of Corunna cannot fly that far - even if it was able to read the legislation and understand where it was supposed to live in order to gain protection. Masked Owls also do NOT rehouse themselves when disrupted. There are many new bird species showing up in nearby Mystery Bay where flocks of Corellas and Glossy Blacks are now trying to find new homes after the logging. Sadly the Masked Owl, according to Government records, does NOT have that ability. The community is holding its breath awaiting the fate of the much loved Sea Eagles. Really Forestry, time to take a different approach to Forestry Management.